Rather than renovate an old building, we decided to rebuild from the ground up! The new facility will provide 6 new washers and dryers along with spacious folding tables and plenty of room to maneuver. 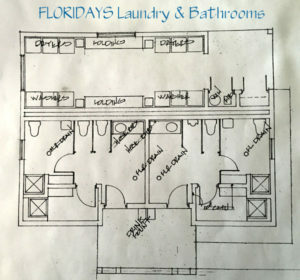 The adjoining shower and restroom areas will be spacious without sacrificing personal privacy. Disclaimer: the original architectural drawing shown is not the final drawing and is shared only to give readers an idea of the size and scope of the project. 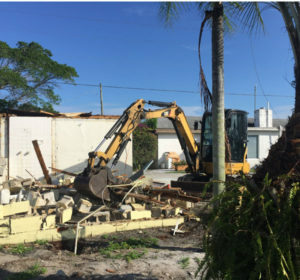 So after six years, the local Hobe Sound eyesore known as Angle Inn Mobile Court is but a fading memory, replaced with an ever-improving RV park that, thanks to our loyal returning visitors, full timers, and welcome newcomers, is developing a solid reputation as a clean, safe, friendly, affordable place to enjoy the Old Florida lifestyle. Our park manager, George, welcomes your suggestions or ideas for park improvement. IMPORTANT NOTE: If you are reading this blog prior to reserving a space between October 2016 and January 2017, please check our Reservations or Amenities pages for regular updates to the status of the renovations. We don’t want anyone to be disappointed.